Why Be Curious? We are trying to break down the word Chianti into its various geographical areas. 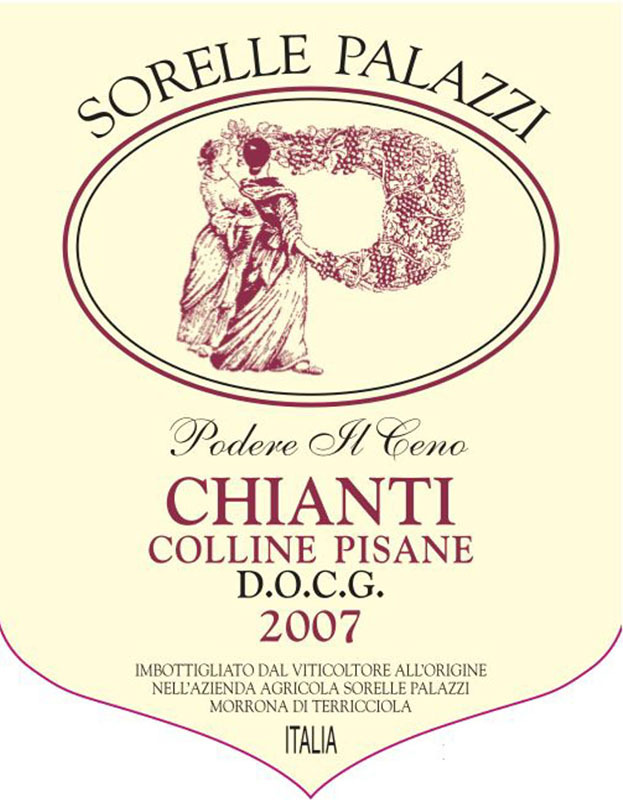 Sorelle Palazzi’s Chianti comes from the Colli Pisani, those hills that extend from Pisa toward the beach around Livorno. It’s an area that’s off the (sometimes too) trodden path in Toscana; it’s also a terroir that expresses an earthy Chianti with non-invasive tannins. Some of that may be due to the soil composed of clay sand, and chalk; some of it too is due to the Organic Practices, Native Yeast fermentation, and vinification in cement. Produttore / Producer: The Palazzi Sisters, or Sorelle Palazzi, started their winery in 1973 in the little-known Chianti town of Morrona di Terricciola, in the heart of the Colli Pisani, between Pisa and Volterra. The 24 hectares are now under the control of the sisters’ nephew, Guido, who recently received his degree in enology and agronomy. It’s a classic Chianti landscape in that there are olive groves and undulating hills; it’s atypical in that there is less monoculture and a good dose of forests and shrubs that provide all kinds of ground life as an excellent eco-system for the vines. The wines too are different from Chianti Classico’s. The soil here is composed of clay, sand, and chalk. Extreme heat and cold is tempered by the proximity to the sea. Certified Organic by ICEA. Cantina / Cellar: The cellar is really a large garage with the old cement tanks from the ’50 being used for the Sangiovese bottling and the Chianti; the Riserva gets some large wood botti. The only small wood to be found is the chesnut and cherry for the Vin Santo. All fermentations here are spontaneous. Nome / Name: Podere il Ceno. Quota / Altitude: 200 m / 650 ft.
Suoli / Type of soils: This vineyard is mostly clay and chalk. Vitigni / Varieties: Sangiovese, Malvasia Nera and Canaiolo. Età delle viti / Vine age: 25 years old. Densità / Planting Density: 4500 vines/hectare. Data di vendemmia / Harvest date: End of September. Metodo agricolo / Agricultural technique: Certified organic. Resa / Yield: 6000 kg / hectare. Fermentazione alcolica / Alcoholic fermentation: In cement tanks. Élevage: One year in cement and one year in bottle before release. Chiarificazione, filtrazione / Clarification, filtration: Plant protein clarification. Zolfo / Sulphur: 40 mg/L total, 5 mg/L free. Produzione annua / Annual production: 850 cases. Tappo e bottiglia / Closure and bottle: Natural cork, 750 ml bottle.